Financial/capital lease is a long-term lease contract where the lessee bears all operating, repairing and maintenance costs, and makes periodic rental payments to the lessor. The lease is not cancelable and the lessee has the option for bargain purchase or renewal of lease contract at the end of the original lease period. In a direct financing lease, the lessor leases the asset by manufacturing or by purchasing from the manufacturer to the lessee directly and the lessee makes regular rental payments to the lessor. The lessor holds the ownership of the asset until the end of the lease period and the lessee holds the possession of the asset. A long-term lease over the expected life of the equipment, usually three years or more, after which you pay a nominal rent or can sell or scrap the equipment – the leasing company will not want it anymore. Although you don’t own the equipment, you are responsible for maintaining and insuring it. The operating lease is a short-term lease contract where the lessor bears all operating and repairing costs of the asset and the lessee pays periodic rental payments to the lessor, and where the lease is cancelable, and there is no bargain purchase option. Under an operating lease, the risk and rewards incident to ownership of an asset remain with the lessor. Also the value of the asset is not fully amortized in the lessor’s book during lease period. A good idea if you don’t need the equipment for its whole working life. The leasing company will take the asset back at the end of the lease. 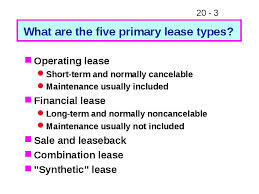 The leasing company is responsible for maintenance and insurance. You don’t have to show the asset on your balance sheet. This offers you an opportunity to have the use of a piece of equipment, often tied in with a maintenance contract, for the duration of the agreement. Ownership remains with the finance company and you will pay a set fee over a period to use that equipment. The contract will outline a residual value at which the finance company will take back the equipment at the end of the contract. Often used for company vehicles. The leasing company takes some responsibility for management and maintenance, such as car repairs and servicing. Essentially, there are two types of leases – finance lease and operating lease. A sale and lease back transaction involves the sale of an asset by the vendor and the leasing of the same asset back to the vendor. The rentals and the sale price are usually interdependent as they are negotiated as a package and need not represent fair values. A lease, which seeks to recover the investment in lease along with interest and profit from a single lessee. This is also equivalent to the finance lease. It is quite possible for the lessors to sign non-cancelable leases for part of the useful life of the asset, to recover part of the investment. The recovery of the remaining investment through subsequent leases or through the sale of the asset at the end of the first contract. Such leases are called partial payoff leases. A lease is called a domestic lease if all the major participants in the arrangement, the lessor the lessee and the equipment supplier have one nationality. Hence, the funds deployed in acquiring the asset are usually from local sources. An international lease transaction takes place when one of the parties to the lease is situated in a different country.